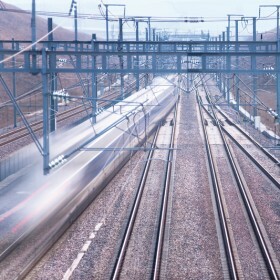 For nearly 40 years, Vossloh Cogifer has been an international leader in the design of high speed rail turnouts and equipment. The company has, from the beginning, been involved in all high speed rail projects in Europe and the world. The company therefore benefits from extensive experience in the study and manufacturing of turnouts and the associated safety devices. Because of the specific nature of high-speed rail, Vossloh Cogifer has been able to reinvent the turnout. 560KM/H On April 3, 2007, when the world speed record on rail was set, a Vossloh Coigfer turnout was crossed at 560 km/h. Today, thanks to this experience, Vossloh Cogifer designs and manufactures a range of products that continues to be innovative, meeting the specific needs of high-speed lines while limiting investment costs.